This sculpture consists of a welded steel skeleton upon which students attached clay, wire and sheet copper. The lowest branches are positioned seven feet from ground level with fifteen feet spanning the two bases. 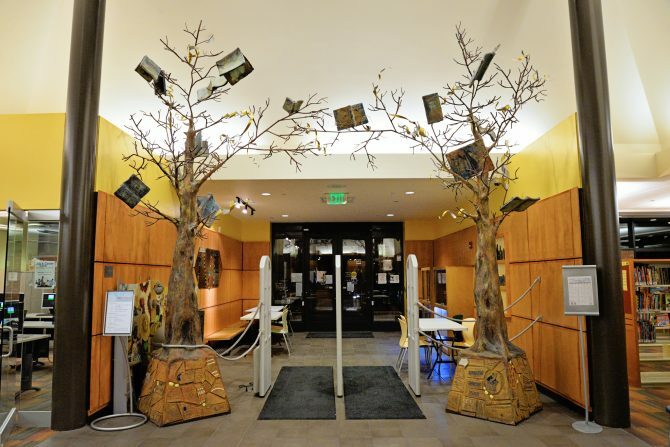 Team members created perched and flying books as well as other small sculptural items for the trees. The planter base is trapezoid in shape and wider at the bottom to enable viewers to see the illustrated tiles commemorating the North Omaha Community.